When people talk sustainability this can mean many different things. Rob Roggema explored the options and trade-offs available at a recent Waterloo capacity building event. Many people think that creating sustainability is done to save the earth, or that increasing sustainability is more expensive. Instead, a practical approach to create a sustainable environment is much more productive and brings a better environment for everyone. How does this work? 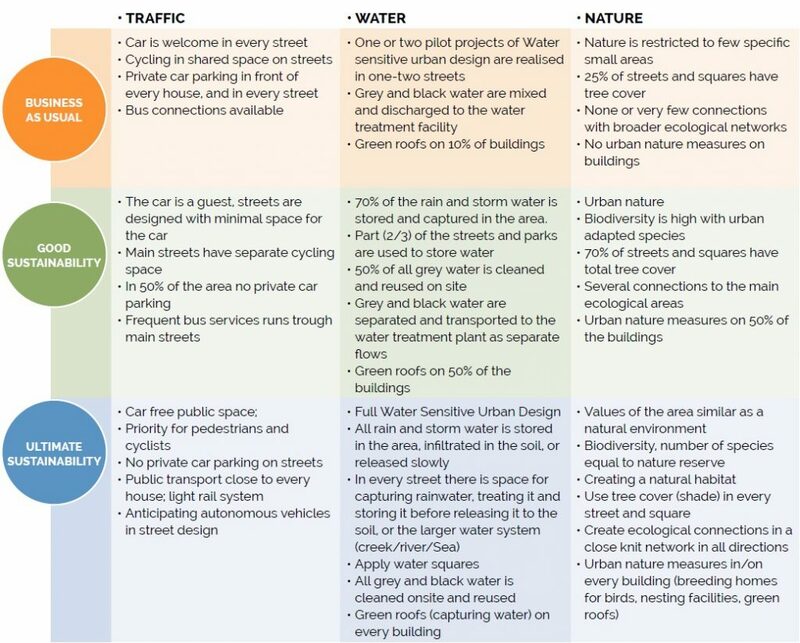 For each of the themes – traffic, nature, water, energy, food and waste – three different sustainability levels are defined. These levels are based on international standards, and represent the ultimate sustainability (level A), good sustainability (level B) and business as usual (level C). You can see the key measures for each theme in a table below. Because each theme consists of a range of possible measures, choices are possible within every theme, for A, B and C levels alike. These choices depend on the concrete context in which the measures need to be implemented. In the case of the Waterloo Estate, we are talking about the public space and the buildings in which these sustainability levels must work. Also, understanding the different levels of sustainability and their trade-offs helps involved residents and other stakeholders to choose a certain level, and to use this knowledge as an input in the planning process, whenever they are asked to give their response to planning proposals. 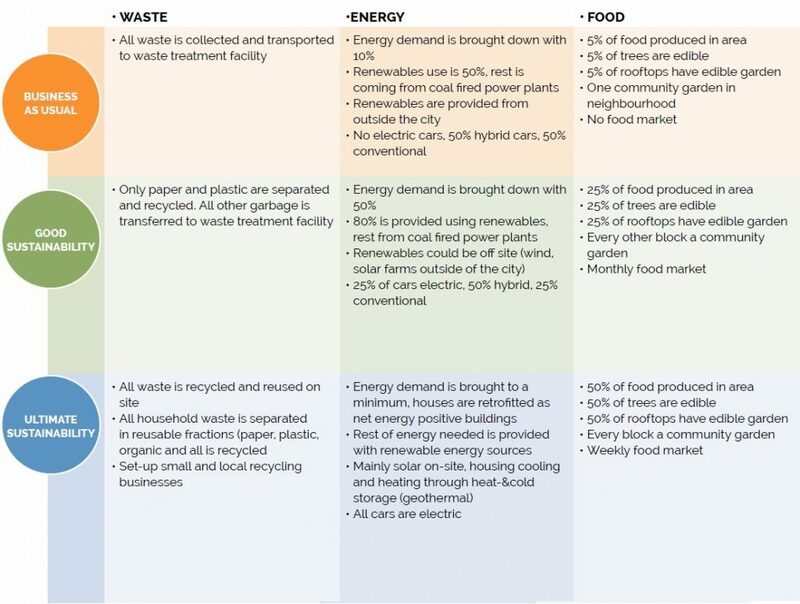 Looking at waste, the highest possible sustainability level is that all waste fractions are separated and everything is recycled or reused within the area. The reuse of materials like plastics, tin, iron, glass, paper, and hardware and old appliances could form the basis for small enterprises and shops, which create new products out of waste materials. Organic waste can be centrally collected and used to generate energy after bio-fermentation (bio-gas or bio-electricity). At first glance, it could seem impossible to score 100 per cent waste recycling, but local initiatives for these small enterprises could be subsidised and stimulated and slowly grow in number. On the longer term, a high percentage of recycling materials is certainly possible. A high level of sustainability for the water theme involves accommodating surplus rainwater to prevent flash-flooding, and cleaning and reusing grey and black water from households. Concrete in urban areas, including roofs and pavements, increases the problems of discharging rainwater. The historic creek system is not there to cope with the accumulation of water, which leads to flooding in the streets and buildings. 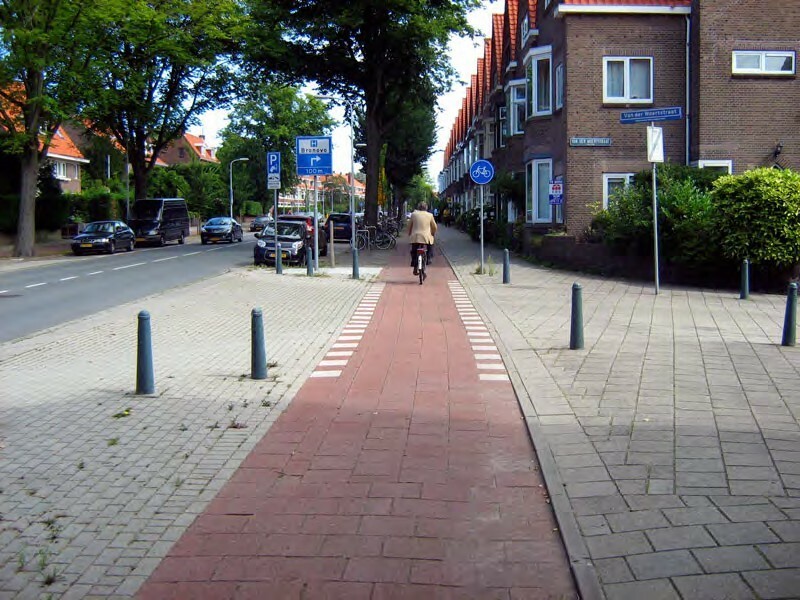 This problem is relatively simple to overcome, but it requires smart design of the public space. If water can be stored on rooftops and in streets and parks and other green spaces, even temporarily, it will be released slowly to the current drainage system and not cause any flooding. Green roofs, temporary green basins and water squares are methods to capture water, store it and release it slowly. Dealing with grey water (all household water except toilet water) and black water (toilet water) requires well-controlled natural treatment. Grey water can be treated in public spaces and form a green strip in streets or parks, and can be reused inside homes after cleaning, for instance as toilet water. 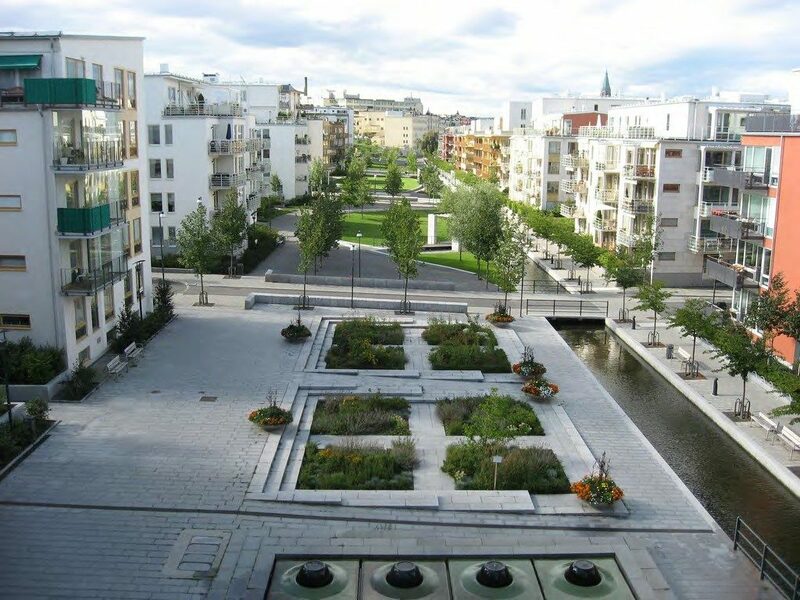 Water Sensitive Urban Design (WSUD), as practised in the Netherlands and Australia, offer numerous examples of grey water treatment. Black water treatment is more sensitive but could, under the right circumstances, also be applied in public spaces, as the Portland City Council has proven. Even in an urban context there are many measures that can improve biodiversity and the quality of nature. In combination with the water features mentioned above, the habitat for local species can be improved. Green roofs also help. The main effort is to create green urban corridors connecting with the larger ecological grid of the city, in order for animals and plants to migrate to and from green spaces. Even though large green space may not be available, the connection of all smaller spaces and corridors creates an ecological system at a larger scale. Finally, trees play an important role for urban ecological quality, as they provide a lot of shade and mitigate the urban heat island effect, where urban temperatures can rise as much as 5-9 degrees above those in the countryside due to all the concrete and pavements in the city. The lesson here is to keep existing trees as much as possible, and plant many more in public spaces. The highest sustainability level for energy means to use as little as possible, and if energy is used, to supply it from a renewable source. Most energy is used in buildings and by cars. When buildings are retrofitted, energy demand can be brought back to a minimum. In Europe, there are already retrofitted buildings that provide energy to the grid, such as the Prêt-a-Loger project in Delft, the Netherlands. Insulation and the way buildings are built are essential to keep homes cool in hot summers and warm in colder periods in winter. A heat and cold storage system – pumping water down into low surface earth layers and pumping it back up to provide a steady temperature in the homes – is a good way to achieve this. Currently, one of the most energy demanding functions in a house is the electric appliances. A simple way to provide the electricity for those is to install solar panels on the roof. If the energy required is more than can be provided by renewable sources onsite, it may be necessary to source renewable energy from wind or solar farms outside the area. When it comes to the energy use of cars, the future is electric and the number of electric cars, autonomous or not, will increase over the next decade. Provided that the electricity used for these cars comes from renewable resources (wind, solar), electric cars emit much less carbon than conventional cars. More importantly, the use of an electric car is much cheaper, as the energy from the grid costs much less than petrol. The production of food is currently invisible to most of us. Multinationals transport goods over enormous distances to the (super)markets. A more sustainable food system produces the majority of the food closer to where it is consumed, and can even involve local people in the production process. Food can be grown on rooftops, in community gardens and on trees. If edible trees are planted in the right places (not above car parks, for example), fruit could be picked from the street. Community gardens and rooftops, where people plant, manage, grow and harvest agricultural products, become a haven for people to meet, and they also increase biodiversity. People in the neighbourhood could consume their own produce, but a system in which the products grown collectively are sold in local markets also means the economic benefits stay inside the community. This article concentrates on the higher ambition levels for each of the themes. It does not mean that a choice for the highest level is always necessary or possible. People who are living in the area and working together on these issues can discuss and decide what is achievable. This is already the biggest leap forward that can be made at this time and could be the first step towards the highest ambition level. It starts with engaging the residents in the process of making their own choices around feasible sustainability options that are not restrictive in nature, but that open up the space to grow towards increased wellbeing for everyone living in the Waterloo Estate. This article was produced for community capacity building for Waterloo but is generally applicable. It was published in the February 2018 South Sydney Herald in the lead up to a workshop giving people hands on experience in looking at sustainability options and trade-offs. Further resources on this topic can be found on the Capacity Building Project page of the Inner Sydney Voice website.